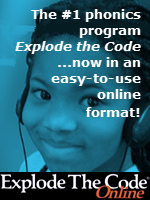 Are you thinking of adding a Chromebook to your homeschool? Chromebooks run Google's Chrome OS operating system and are designed to run cloud-based applications and store data online. 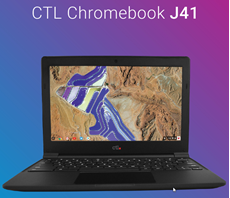 Check out this exclusive offer on award-winning Chromebooks from CTL (Compute•Teach•Learn): the touch screen CTL Chromebook NL7TW-360, the new J41 and the option of the J41 with X- Panel Cover. Students can be "creative" on hardware. The award-winning NL7TW-360 features Wacom® EMR pen technology with a touch screen. Now you can easily jot down notes, create one-of-a-kind designs, or operate the Chromebook with intuitive and accurate control using the included Wacom® EMR pen. The NLTW-360 also features a sturdy 360-degree hinge which allows the unit to be rotated from laptop mode to tent-display, to tablet with smooth and stable performance. The J41 provides performance, durability, and value, and was awarded an Excellent rating from PC Magazine Editor’s Choice. The J41's sturdiness and water-resistance make it more durable than other, more expensive devices, all while being remarkably lightweight! 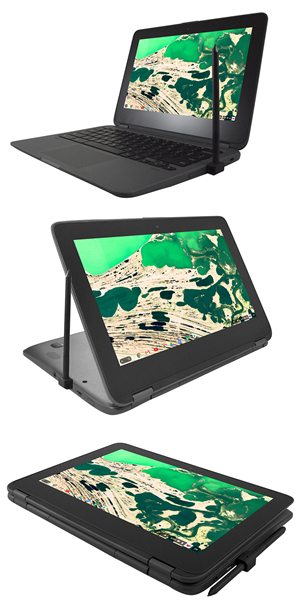 The more rugged Chromebook J41 X-Panel has the same technical configuration as the J41 and includes an affixed protective cover and doubles as a whiteboard -- perfect for a homeschool! Learn more about the CTL 2-year Warranty. As with any electronic device, please note that normal wear and tear, and accidental damage is not covered with this warranty but should your unit components fail within the 2-year period (based on your order date), they will be eligible to be replaced. There is one battery replacement in the 2-year period allowed. Fulfillment: Within one (1) business day, the Co-op will send your order to CTL for processing. 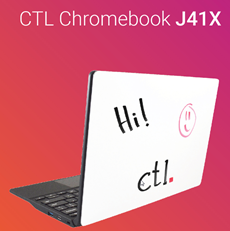 CTL will then ship your Chromebook(s) within three (3) business days. Shipping: Shipping charges are $16.00 for the first Chromebook and $7.50 for each additional Chromebook. There is a $20 surcharge for HI and AK addresses. 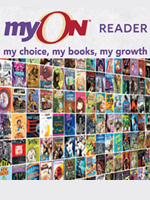 NOTE: Members can purchase up to three Chromebooks per order. CTL will ship orders via UPS Ground. Once your order has shipped, you should expect your order within 6-8 business days for US street address. Please allow 8-10 business days for HI and AK. Expedited shipping is not available. We're sorry! Shipping is only to U.S. street addresses. Returns/Cancellations: If you received a damaged or non-functioning CTL Chromebook, you can request a replacement or a full refund (less shipping costs) if you do so within 30 days of the date of purchase. Submit your refund request at our Contact Us page. 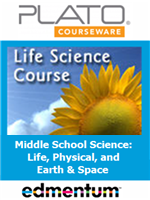 You will receive return instructions via email and/or phone. Members are responsible for return shipping costs. Note: Gmail Email Address is required to use Chromebook. Special Co-op Bonus! 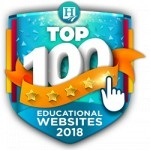 Free Premium Subscription for 1-year (value $8) for Squid Notes - take digital handwritten notes for class, markup PDFs, and more! Plus, receive a 2-Year Warranty!